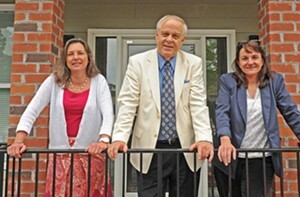 Greg Pearson, center, with Advertising Director Carol McCracken and Editor Nancy Nusser (right). Independent community newspapers aren't big business. Berkshire Hathaway, which purchased the Richmond Times-Dispatch and 62 additional newspapers from Media General last week, probably isn't knocking on his door. But Greg Pearson, owner of the weekly Chesterfield Observer, is doing just fine, thank you. Launched in 1995, the Observer started out as a low-budget paper with a circulation of 7,000. Today, circulation is up to 69,244 a week (the vast majority mailed directly to residents), and Pearson, a former radio broadcaster, launched a monthly magazine earlier this year. He also just bought a 3,000-square-foot building near Brandermill. Advertising sales are on the rise: Through the first 20 weeks of this year, Pearson says, sales are up 151 percent compared with the same period in 2007, when the Great Recession hit. While much of the newspaper industry continues to see circulation and advertisers slide, Pearson bucks the trend with an old-fashioned formula: hard news sprinkled with community columnists and local sports. "We have a marketing plan and we're executing it with good people," he says, adding that all of the employees with the company at least two years made more money last year. "You can't grow your business by reducing expenditures." And while the newspaper industry frets over online content, Pearson sticks with what he knows works: print. "Our print model is not broken," he says. The Observer posts stories a day after the paper comes out. So if newspapers are dying, don't tell Pearson. "We're not where we need to be yet," he says. "We need to make some investments."